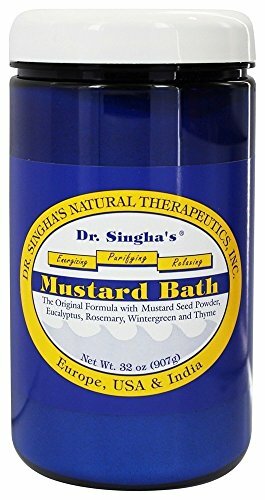 Mustard Bath, 32 oz (907g). This is it! The most uplifting and restorative therapeutic bath on the market! In traditional medicine, Mustard is renowned for its stimulating, cleansing and rejuvenating qualities. The warmth of Mustard gently opens pores and assists in the elimination of impurities. Our popular bath is now widely available in natural food stores, spas, health clinics and specialty shops worldwide. Contains: Certified Organic Mustard Seed Powder, Essential Oils of Eucalyptus, Rosemary, Wintergreen & Thyme and Gum Benzoin in a base of Sodium Carbonate.